Had a nightmare of a problem with my Evolution motor on my ’97 Road King requiring a lot of hours and A LOT of parts. Dean was very understanding, patient and accommodating to my situation and honestly wanted to help in any way he could. I knew right away Dean Of Cycles was where I wanted to take it. When it comes to engine work you definitely want to know its done right and with Dean that’s exactly what you are going to get! 20 plus years of experience, honesty, and the best price in town all in one shop? This is the place to get it all done! Dean did a lot of work on my 00′ Dresser to get it back on the road, brought it home for about half what I was quoted by the company and I got it back fast! He performed many maintenance services I wasnt even aware it needed. He’s a damn fine machanic and his attention to detail with my bike and pleasnt customer service has earned my business from here on out. This is the way a bike shop should be. Thanks Dean! I agree 100% with everything being said about the man, Dean! If you’ve got a bike you care about than you owe it to yourself and the bike to bring it to Dean of Cycles. They’re honest, fair, timely, and won’t cuss in front of your kids! What more can you ask for?! Thank you very much again for fixing the clutch starter and mounting rear tire on my 2003 Fatboy. It runs great now!!! your shop has low pricing and I was really pleased with your service nice care on details!!! I will come back and see you on my next service schedule! Take care! 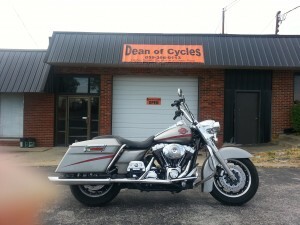 This was my second time got my 2003 Fatboy serviced and I became a big FAN of “Dean of Cycles”. Dean is a very honest guy and willing to listen and help customer in every details. Thanks again Dean for keeping my Fatboy healthy and ready for coming Spring. You absolutely impressed me again with your honesty, great customer care and the jobs done on my bike! You are a great mechanic and a great businessman who cares of the long term relationship with the customers!!! See you on my next service schedule! Great service. Put mini apes on my 883 for $700 cheaper than the dealer quoted me at. Got the job done on time and very well!!!! May 16 2016 i just picked my Harley up an I have to say all I had done at first was a tune up and oil change,and when I called to see if it was done Dean told me about my back brake disc being a little worn and asked if wanted them replaced the price he quoted me was very reasonable as was the oil change and all the does what he tells you and does it in a timely fashion nothing hidden and will answer any and all questions you might have.like I said his prices are way below the others but the service is top notch I know he is gonna be getting my business again.Check him out if you don’t believe me and you will see. Had my 2009 Ultra Classic here for a all fluids change including the fork oil. I am a totally pleased customer. I will be bring my Harley back here for all service. Dean and his staff treat you like family!! !